Image on the Preamble label released in 1989, a 2 CD set based on RCA's previous LPs: "(P) 1957 Loew's Inc. © 1989 FCMC -- Produced by John Lasher"
January 2007 CD Release: "Film Score Monthly's definitive edition -- on the eve of the movie's 50th anniversary -- features a comprehensive chronological program of Green's masterpiece (containing many previously unreleased cues and passages), along with a bonus section of alternate and unused cues. The entire score (save one-half of one cue) has been remixed and remastered from the original 35mm stereo master tapes for vastly improved sound quality." Performing Arts--Motion Pictures, The Library of Congress, 1998, 268 pp, hard cover (ISBN 0-16-049237-8) with cover photo of the Forth of July foot race between John Shawnessy (Montgomery Clift) and Flash Perkins (Lee Marvin). "Composer-writer Ross Care presents an in-depth and entertaining analysis of Johnny Green's score for the film version of Ross Lockridge, Jr.'s great American novel Raintree County. Having interviewed Green, Care is able to provide behind-the-scenes stories about the development of the score and the making of the film. One cannot help but agree with Care's conclusion that the film is somewhat failed, but the music captures the intent and sensibilities of the author and remains as the real tribute to his novel." --Excerpt from: "Editor's Note", Iris Newson, Performing Arts--Motion Pictures, The Library of Congress, 1998, p. 9. Several quotes from Ross Care, "The Great (Almost) American Novel Becomes The Great American Film Score"
"Gigantic MGM also encompassed the Arthur Freed unit, with its own musical staff headed by Roger Edens (1905--1970) who pioneered the Freed sound, a lush, Franco-Broadway manifestation of the overall MGM sound which was otherwise pretty much defined by the supraepic Euro style of Rosza in the 1950s, though Green's one major film score, Raintree County in 1957, is perhaps the Americana classic of the decade." --From: Ross Care, Twilight's Last Gleaming--The Americanization of Hollywood film Music 1950 - 1965, Performing Arts--Motion Pictures, The Library of Congress, 1998, p. 201. 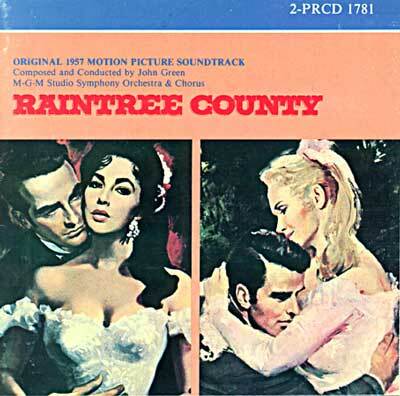 "1957's greatest score remains, however, Johnny Green's for Civil War epic Raintree County from MGM." --From: Ross Care, Twilight's Last Gleaming--The Americanization of Hollywood film Music 1950 - 1965, Performing Arts--Motion Pictures, The Library of Congress, 1998, p. 224. Performing Arts--Motion Pictures, The Library of Congress, 1998, p. 236. To: Ross Care's complete Library of Congress Essay on the Score reprinted here with additions and a new introduction. To: Ross Care's liner notes booklet for the recent 2-CD Film Score Monthly release of the soundtrack. To: Piano music for "The Song of Raintree County."